For anyone with a business, finding new customers is a challenge, and scammers know it. 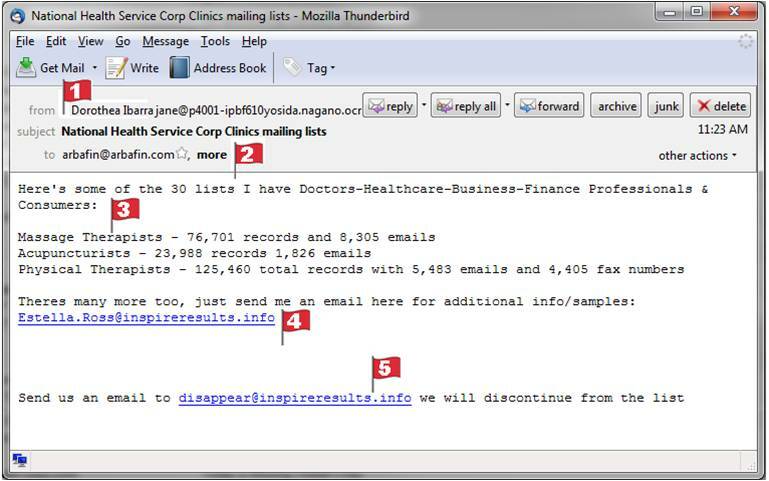 Mailing list scams try to snag unsuspecting businesses with offers of vast lists of potential new clients. 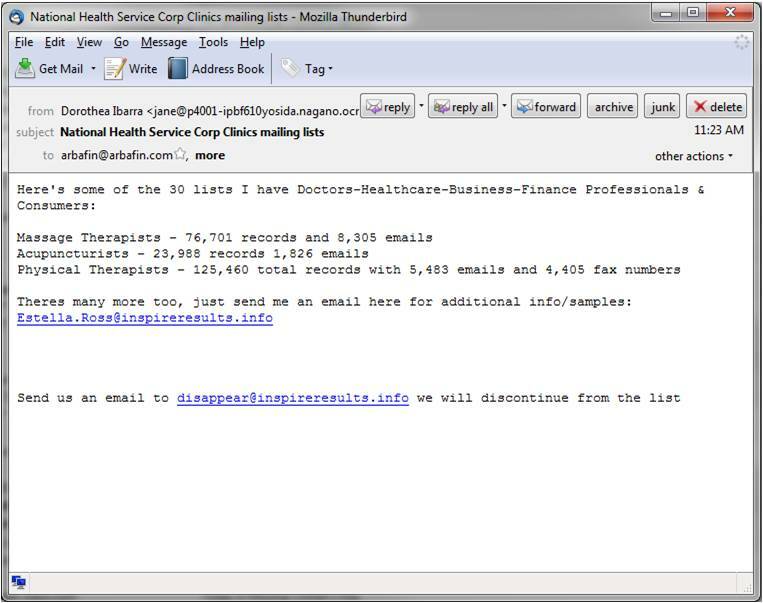 In the example below the ‘lists’ target massage therapists, acupuncturists and others within the ‘doctor-healthcare-business-finance’ bucket. You should be able to find at least five red flags that tell you this e-mail is fraudulent. Scroll down to see the answers, but try to find them yourself, first. If you find four you’re a pro with little to worry about. If you find fewer than three, consider practicing on some more of our spam scam examples. The email is unsolicited an comes from an individual. This alone is enough to tell you it’s a scam. The name and the email name don’t match. The email address is a ridiculous string of numbers and letters. The email is not addressed to you. The email is unprofessional and has grammatical errors. The goal of the scam is to get you to click on one their links. Never click on a link in an unsolicited email. Ever. A quick search shows this site is tied to ‘serious spammers. Note that yet a third name is listed here (we had ‘Dorothea’ and ‘Jane’ in the From: line, now we’ve got ‘Estella’. It’s all bogus. Yet another link, this one is intended to trick anyone who wants to stop getting junk email. The ‘unsubscribe’ link will land you on the same spammer page, with whatever malware or further scams they’ll try to dump on you. Any one of these red flags should have convinced you this email is a scam, and you’ll find similar scam flags in other offers of this ilk.